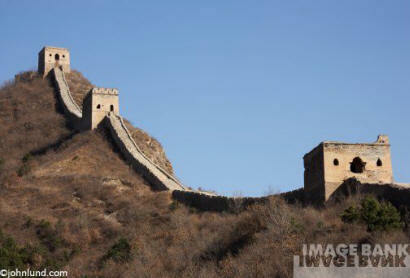 Taking pictures of the Great Wall of China was one of those peak experiences, one of the primary reasons I travel. The sense of history was almost palpable; the only sound the chirping of a few birds. The Guest House at the base of the Simatai section of The Great Wall was typically rural Chinese in its bare and no-frills atmosphere. I had been sicker than a dog for a week now and really was looking forward to a nice hot shower. It was March and here in Simitai it was freezing cold and windy. I checked into my room and turned on the shower. I let the water run a very long time but it didn’t seem to be getting any warmer. 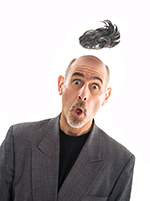 I checked at the front desk and the clerk dispatched a man to my room to see about the hot water. He told not to worry there would be plenty of hot water in the morning. Swell. The hot shower would have to wait. The next morning (which at 4:00am came all too quickly), I turned on the water and surprise, no water. Not even any cold water! Oh well. I bundled up, grabbed my camera gear and headed to the lobby to meet my traveling companion, Ginna Fleming, and our guide. We needed our early start so that we could be well up on the wall and in place to shoot the sunrise. I have learned from years of travel, stock and assignment photography that there is no such thing as “too early” but “too late” comes in a hurry! It was a short walk to the wall. It was too soon for anyone to be around; just the two of us and our local Chinese guide. She was a villager from nearby. She explained to us that the village had once been located here, but that when the wells went dry the village had to move about 4 kilometers away where they could find more water. She told us that village life was very difficult and guiding tourists was much easier. We began to walk up the wall, which climbed the side of the mountain at a fairly steep incline. 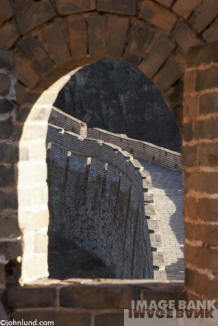 The top of the wall was, in effect, a stone staircase and we walk up from watchtower to watchtower one step at a time. We climbed the “staircase” for almost two hours before the sun began it’s own climb into the sky. We passed beyond the portion of wall that tourists normally stop and past warning signs prohibiting us to go further…but it was early and in the winter and there was no one there to stop us. Here the wall had not been reconstructed and was in ragged disrepair. Our guide pointed out graffiti that the men and women who built the wall so many years earlier had left behind. The stones were loose and crumbling and we had to be careful as we hiked up the structure. As the light began to spread across the landscape we set up our tripods and framed a distant section of wall that spread out below us like a gigantic snake undulating up and down the brown and barren ridges and hills. For me it was one of those peak experiences, one of the primary reasons I travel. The sense of history was almost palpable; the only sound the chirping of a few birds. No tourists, no one hawking guidebooks. Just this ancient wall, a grand vista of the Chinese landscape, and the cold wind pressing on us as the sun struggled through the morning mist. When its rays finally reached the valley below us and etched the details of the wall in it’s warm light I knew the photos too would be the effort. While I was there to create adventure and travel stock photography, I was also there for the experience and spent several hours in mostly quiet reverence. It wasn’t until we were well on our way down that we came across anther person who passed quietly by us on her own journey up the Great Wall. Started under Qin Shi Huang circa 220 B.C., the first 3,000-mile section of the Wall required the efforts of 70% of China’s population…over a million peasants, prisoners and soldiers. 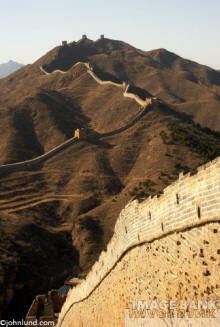 There are over 10,000 watchtowers and beacon towers on the Great Wall. There really is no “single” wall, but rather a series of walls, some brick and some earthen and built over a span of 2000 years. 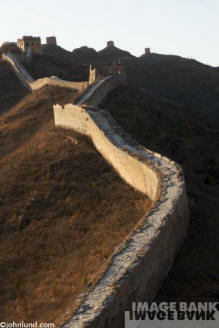 The stone and bricks from the Ming dynasty portion of the wall would be enough to circle the earth five feet high! Our guide told us that the wall had never stopped any incursions. The intruders simply went around the wall or bribed the guards to let them through.